This interactive presentation contains the latest oil & gas production data through January, from all 7,437 horizontal wells that started production in the Niobrara region (Colorado & Wyoming) since 2009/2010. After the almost 50% increase in oil production in 2017, based on preliminary data output in January came in a little lower than in the previous month, probably due to lower completion numbers in winter months. As you can see from the light blue color in the above graph, oil production from wells that started in 2017 contributed ~2/3rd of production in January. If you look at these two states separately, e.g. by using the ‘Basin’ selection, you can see that recent growth in Colorado has been far stronger than in Wyoming, and production in the latter one has not yet recovered to its previous peak. In the ‘Well quality’ tab the production profiles are shown for all these wells. You’ll note that the general behavior of these wells appears rather predictable, all the way down to low production rates (< 20 bo/d). Wells that started in 2017 had a significant increase in early recovery: roughly 90 thousand barrels of oil will be recovered on average in the first year by a well that started production in 2017, whereas the typical 2016 well needs an extra year to get there. This increase in performance has led to a spurt of drilling and completion activity: if you look at the number of wells that are spud in the ‘Well status’ overview you can see that recent levels are twice as high as the low point two years ago. The last tab (‘Top operators’) shows that the two leading operators, Anadarko & Noble Energy are both producing near all-time highs. The sudden jump in early-life performance since the 4th quarter of 2016 is visible here. Less oil is recovered per well than in the other oily basins, but wells are shallower (i.e. cheaper) and also produce a significant amount of gas with it. The last two dashboards show that the gas/oil ratio (GOR), and the water/oil ratio (WOR) have on average not changed significantly in this basin over the last couple of years. But how the GOR develops over the life of a well has changed, as the top graph shows in the ‘Gas oil ratio’ dashboard. Since 2014 the rise in GOR continues longer for newer wells. 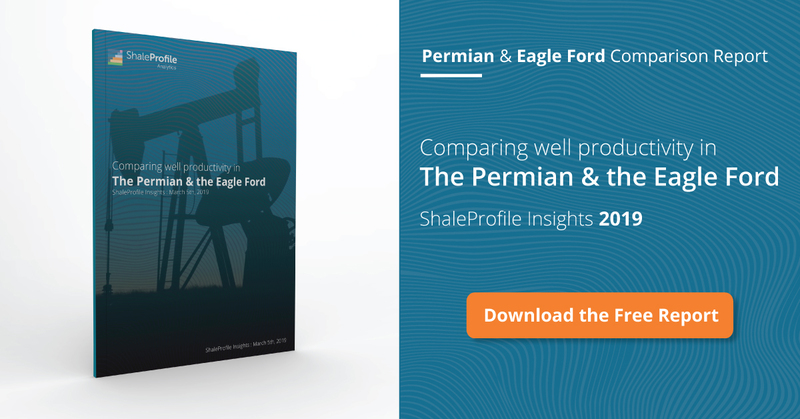 On Thursday I will have a new update on the Eagle Ford, followed by the Permian early next week.